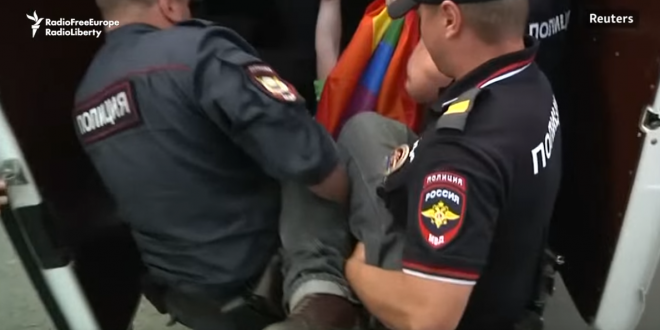 RUSSIA: Police Arrest 25 LGBT Activists [VIDEO] - Joe.My.God. Russian police have detained at least 25 LGBT rights activists during a protest in St Petersburg to promote the rights of sexual minorities. About 60 activists gathered at the main square in the city centre, despite a ban being placed on the rally. They held up placards and rainbow-coloured flags, and called for LGBT rights to be protected. Organisers of Saturday’s rally said that each demonstrator had protested alone, to avoid the rally being classified as a gathering. The demonstration’s co-organiser Aleksei Nazarov told the AFP news agency that police had targeted demonstrators who had the “most colourful flags and clothes”.